Aqua Pura bottled waters are unlike most bottled waters. What makes our bottled so unique is how we purify the water so the only thing you can taste is premium and pure Australian water. Unlike spring waters, you won’t taste any nasty impurities as we remove any chemicals, bacteria or salt that might be lurking beneath the surface. We have a range of pure water varieties perfect for every occasion. 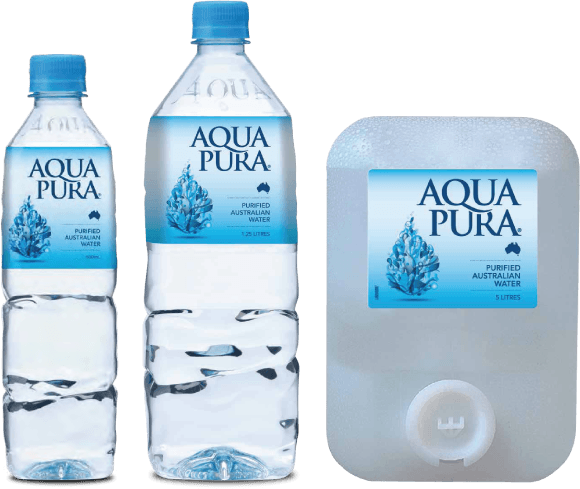 Australia’s pure water brand is available in three size formats; 600mL, 1125mL & a handy 5L size which has been designed to fit perfectly in your fridge. 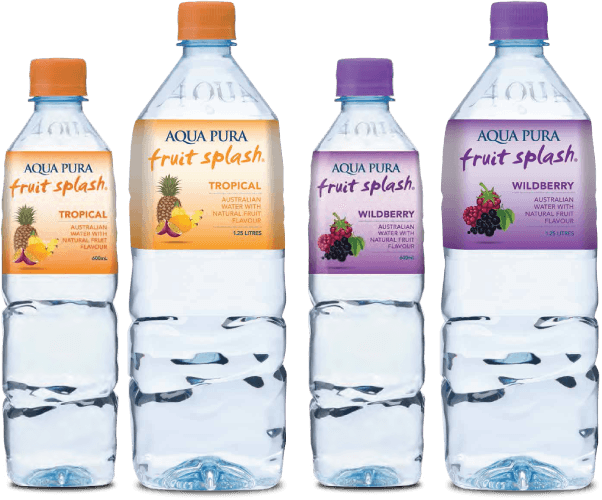 Aqua Pura Fruit Splash combines Australian water with a splash of natural, true to fruit flavours. Lightly sweetened to enhance taste, Aqua Pura Fruit Splash refreshes and invigorates. But never bores. 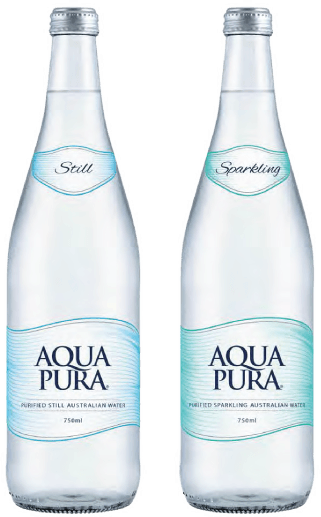 Still & Lightly Sparkling Aqua Pura table waters are premium, elegant, pure & the perfect addition to any table setting. Enjoy the pure taste as the perfect palate cleanser or mixer as the purified taste won’t influence its mixing partner. Aqua Pura water is unlike most other bottled water. We take Australian water and remove all the impurities, leaving a unique and consistent taste profile. 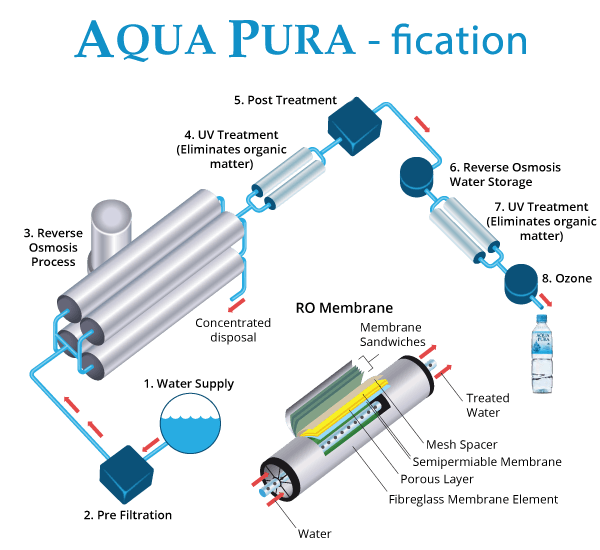 We use a purification technique called Reverse Osmosis, which is the finest level of filtration available in the world. Reverse Osmosis removes the dissolved solids and impurities such as bacteria, pyrogens, dissolved salts, detergents, pesticides, chlorine, viruses and organic contaminants. transforming it into high purity water. These residues are removed by a separation process that uses high water pressure to reverse the natural osmitic process and force the water through a semi- permeable membrane which rejects most other contaminants and retains them on the other side while allowing the pure water to pass through. The result from this process is pure, clean water, more supreme to spring and mineral waters which may contain impurities and will have variations between brands and bottles due to geographic and mineral content differences. Aqua Pura guarantees a consistent and quality product with the same great taste every time. Owned and produced by Bickford's Australia pty. ltd.